I was tempted to leave Texas and haul tail to Arizona. I had been enjoying mostly spring like weather since the beginning of my trek and I really was ready for some heat. 70s would be nice but I’d prefer 80s. To find that I’d have to skip one of the items on my must see list and that seemed to miss the point of keeping such a list so I pointed the truck north to New Mexico. Carlsbad Caverns was my primary destination. I have always wanted to visit it and had never been closer. There is a campground right outside of the park’s gates called White’s City RV Park. It was well over my budget at $36 per night but I justified the cost in convenience and gas savings as the only significantly cheaper options were 35 miles away. The top side of this part of New Mexico is not very attractive in my opinion but what’s under the earth more than makes up for it. I got to camp at noon, set up quickly, and headed to the cave. The self-guided tour consists of two parts: a walk down in through the natural entrance and then paths through some of the more amazing sections of the cave. You can access the lower paths by way of an elevator and skip the natural entrance if you like. Here is the natural entrance. The natural entrance trail is described as a strenuous one and a quarter mile, 750 foot decent into the cavern. You can’t help but think “how strenuous can a 1 mile walk downhill be?” By the end of this walk you will likely agree with that description except you might question if it really is just over a mile long because it seems much longer. There were plenty of people that should not have chosen this route and were clearly regretting their decision. I absolutely would do it again but would likely start fresh in the a.m. instead of doing it after a morning of driving. I went back the next day and was there just after opening. I took the elevator down this time and walked the main cavern again without the crowds. It was great enjoying the beauty without all the noise. I then took the guided tour that they offer every day. The tour was fine but it didn’t offer anything special over the self- guided portions of the cave. They offer some longer tours, a different one every day of the week. But those were booked a month in advance when I was there. I’d love to plan another visit and reserve a tour every single day. WOW! 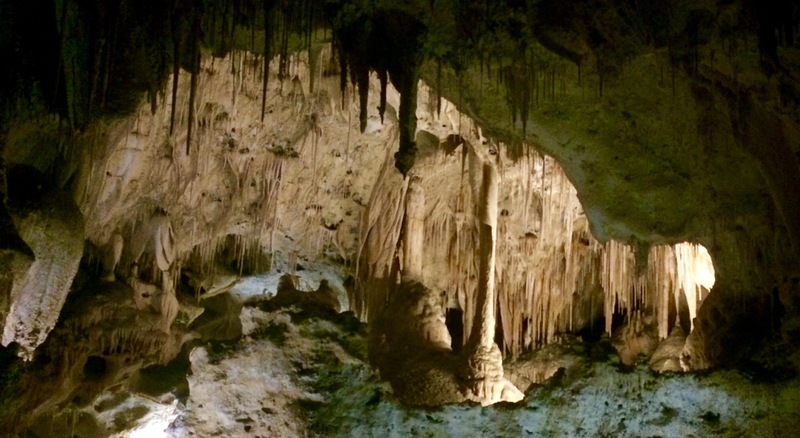 is about all I had to say during my visits inside the cave and sums up my opinion of Carlsbad Caverns. I’ve seen quite a few caves but none come close to the beauty and size of this place. Awesome views. Looks like a great place to have fun getting lost.